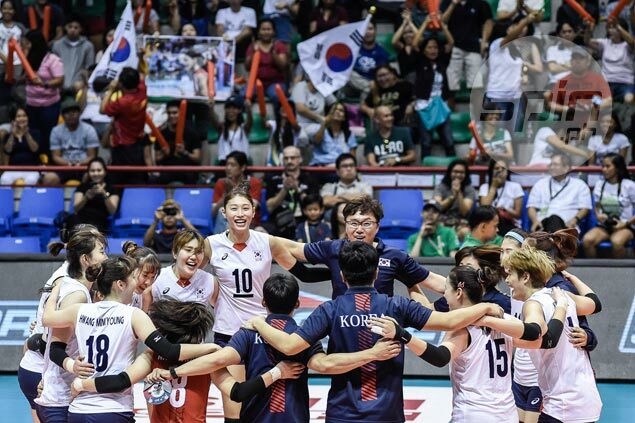 BINAN, Laguna — Korea vented its frustration on dethroned champion China, 25-11, 25-18, 25-20, to salvage third place in the 19th AVC Asian Senior Women’s Championship on Thursday at Alonte Sports Arena. Kim Her Jin scored 16 points for the Koreans, who were coming off a straight-sets loss to Thailand in the semifinals that ended their bid the title. Park Jeong Ah scored 13 and Kim Yeon Koung had eight markers as the Koreans somehow got back at the Chinese, who beat them in the Finals of the 2015 edition in Tianjin, China. Han Sio Ji and Kim Su Ji each had seven points for Korea, which also defeated China in the battle for third in the 2013 edition in Nakhon Ratchasima. China, winner of the tournament 13 times, missed a podium spot for the second time. Jin Ye had 10 points for China. Meanwhile, Vietnam beat Chinese Taipei, 25-23, 25-22, 25-23, in the battle for fifth. Tran Thi Thanh Thur led Vietnam with 18 points, while Ha Ngoc Diem added 14. Le Thanh Thuy, Pham Thi Kim Hue and Doan Thi Xuan combined for 21 markers for Vietnam in the one hour and 29-minute match. Lee Tzu-Ying scored nine for Chinese Taipei.